Studio Carry On Harry , Singapore : Studio Guest Maureen is a modern day mystic, who has become world famous for her trainings in personal development and spiritual awakening in more than two dozen countries. The author of three bestselling books, she is founder of Transformational Enterprises and the Akashic Records Guides International. Living herself in 5D and above (there are 12 dimensions described in the book), she has a unique first-hand perspective that she imparts to those ready to accelerate their transition into the higher dimensions. Recently interviewed for Carry On Harry talk show by Show Host from Singapore Maurine has shared her thoughts about 5 D Living with some great examples. 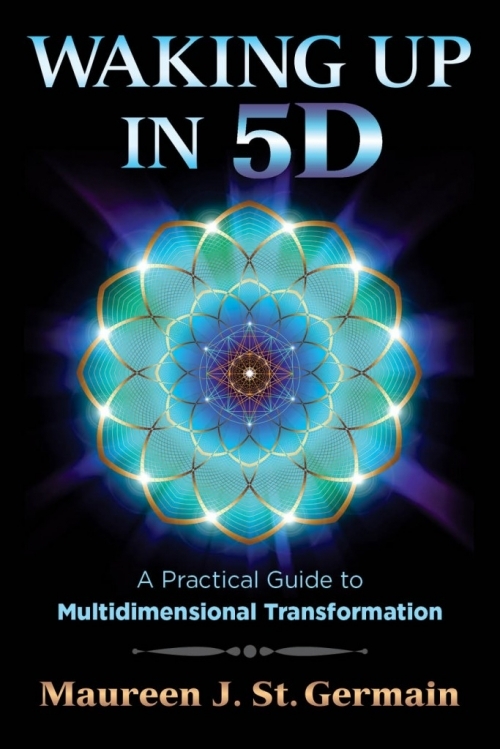 Maureen’s newest book Waking Up in 5D: A Practical Guide to Multidimesional Transformation provides tools and teachings to guide you in the transition from the polarized mindset of the 3rd dimension to the joy and love of 5th dimensional vibrations. It explains how to recognize the 5D experiences you’ve already had, identify the differences between 3D linear thinking and 5D multidimensional thinking, and turn 3D viewpoints around to expand your perception of what is possible. Waking Up in 5D includes exercises to protect your energies, especially while sleeping, and Sacred Geometry meditations to open yourself to higher frequencies. It reveals how to develop a Higher Self connection, increase your sensitivity to dimensional signatures, and consciously choose 5D, where love is the governing force. We are all transitioning from the narrowly-focused and polarized awareness of the third dimension and waking up to the higher vibrations and abilities of the fifth dimension. Each of us has already experienced 5D: Think about your most memorable and uplifting experiences of the recent past--where everything went well, interactions were harmonious and loving, and all felt blissful and happy--that’s 5D. In this ascension manual Maureen explains how to shift your energetic patterns and choose to permanently anchor yourself in the joy, love, and kindness of 5D. Widely known for her Amazon.com best-seller, Beyond the Flower of Life Maureen has been sharing knowledge she has gained from her years of teaching meditation and research on ancient truths. Maureen’s Mmnifestation book, Be A Genie: Create Love, Success and Happinessteaches Sacred Geometry and manifestation, based on Source Code and her discovery of the Phoenix Sequence. Labeled a modern day mystic in Famous Wisconsin Mystics, Maureen has taught in 15 countries throughout Europe, Canada, USA, Egypt, China and Japan. Her books have been translated into Russian, Italian and Chinese. Maureen St. Germain leads workshops in personal development and spiritual awakening. As a seeker, she shares the knowledge she has gained from her of study in ancient truths.Insightful, compassionate, entertaining and funny, her primary focus is developing tools to support individuals in their personal expansion and spiritual awakening through Trainings, Akashic Records, Sacred Journeys, guided meditation CDs,AroMandalas® essential oils aromatherapy and books.Her clients love her velvet voice in her many guided meditations on topics such as the MerKaBa, Letting Go, Manifestation and more.